During the winter, you do your best to maneuver your car away from ice to prevent it from sliding off the road. However, your tires, not you, could actually determine whether or not that happens. An auto repair shop in Cincinnati, OH, Jim’s Auto Clinic has a team of ASE-certified mechanics who are experts on auto maintenance and repairs that increase your safety on the road, including routine tire replacement. Below, they’ve explained the basics of all-season tires along with how they differ from winter tires. All-season tires are meant to keep you safe on the road, regardless of whether it’s a sunny day in the summer or a snow day in the winter. They’re made of rubber that is malleable enough to provide traction in both heat and cold. Are All-Season Tires Safe to Use All Year Round? In most places, all-season tires can safely last throughout the various temperatures. However, if you live in an area where temperatures are consistently below 45 degrees Fahrenheit, then auto maintenance experts recommend making the switch to winter tires, as they will provide better traction and a deeper tread. All-season tires can certainly handle cold temperatures and wet roads, but they’re better suited for light snow. How Do They Differ From Winter Tires? The rubber of all season tires will harden when temperatures drop, which decreases traction and keeps your car from staying on the road. However, the rubber of winter tires stays flexible in cold temperatures, which allows your tires to grip the road better, particularly when braking and turning corners. Winter tires also have a specific tread pattern that’s deeper than all-season tires. This tread decreases debris accumulation and enables the tires to flush out snow and ice. Do you need assistance determining if all-season tires are best for you? Give Jim’s Auto Clinic a call at (513) 662-6696. They have decades of experience as an auto repair shop and have built a reputation based on honest and exceptional services. 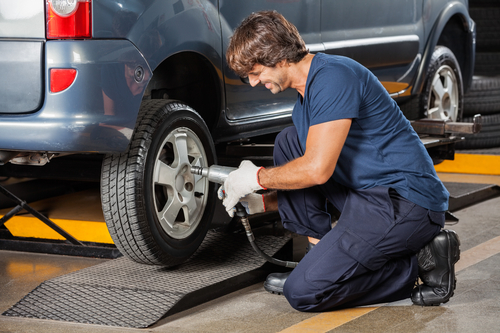 From brake inspections to tire alignment, their certified mechanics will provide the highest quality workmanship in the area. They’ve also earned an overall five-star rating from 860 reviews. They’ve even partnered with a charity, Tails of Hope, to help out abandoned dogs in their community. Visit their auto repair shop online to read glowing testimonials from past customers and to learn about their current specials.